While we’re all called to love our neighbor, there are some people who just plain annoy us. Thankfully, the Office Jerk app helps you blow off steam by letting you throw random objects at an unsuspecting co-worker. 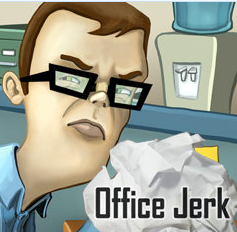 The game's title is describing you; you are the jerk and the other co-worker is the perfect employee. But the other employee is extremely annoying with his “I Love the Boss” mug and a picture of his pet cat that he reaches over and caresses every once in a while. To make this co-worker even more angelic, after you smack him in the head with something, he continues to work! The game’s concept is simple: you just select an item from your desk and use the touch screen to slide it in the direction you want it to go. While the employee doesn’t move around too much, the oscillating fan on your desk affects the wind velocity and direction the object will go. There’s a score card that keeps track of your best and your current score, though the current score gets erased when you miss your target. Besides beaning your co-worker in the head, you can hit background targets for some serious points. You get extra points for breaking the glass office door, water cooler, and the employee of the month picture that’s featuring your beloved co-worker. Now that we’re familiar with the targets, let’s discuss the arsenal. The most basic items are the wad of paper, pencil and brick eraser. The suction cup dart is relatively harmless as well. If you’re into one-sided food fights, the egg, chocolate frosted cup cake and pie will guarantee some giggles. The golf ball, red stapler and coffee mug will put a noticeable lump on the guy’s head. Lastly, the stick of dynamite will turn any area it hits black. The animations and physics seem to be spot on. When the fan is blowing pretty hard, aiming will be difficult. Each item has its own sound effect and temporarily changes the scenery where it lands. Nothing mind blowing but it gets the job done. The office background noises are spot on and remind me of my days spent in a cube farm. For 99 cents this game is reasonably priced. I got mine for free through Amazon’s daily Android app give away, but I’m rather torn in recommending it. Yeah I got a few chuckles and so did my kids, but other than beating my own score I don’t see much replay value. Overall, it can be a great stress reliever but a lousy example of being a good neighbor.